If you read any blogs written by people who live in Seattle, or if you follow any of us on Twitter, you are probably tired of hearing us complain about the weather. This has been the summer that practically wasn’t. We have had some decent days here and there but we have also had lots of low temperatures, clouds, and rain. After a long wet dark spring, we all feel we are due some sunshine. Our summer is why we put up with the winter after all. I am looking ahead to the forecast for the week and it looks like we have some warm and then hot weather on the way. I can’t tell you how happy that makes me. Like all good Northwesterners, I usually complain when it gets too hot. I like my temperature right around 78º, thank you very much. But at this point I don’t care. I’ll take heat as long as there is sun so I can make summery food and enjoy it out on our patio instead of in the kitchen with the heat on. Polenta has always been a bit elusive for me. All that stirring! For some reason I don’t mind stirring risotto but I hate stirring polenta. The good people at Cook’s Illustrated have, in the past year, come up with ways to make both risotto and polenta without constant stirring and I give them a big cyber-thank you. I adapted their practically no-stir method slightly (because I was just lazy enough that I didn’t want to fashion my own flame tamer), and just gave it a good stir every 5 minutes or so. So what do we have here? Triangles of polenta wedged in tight on a bed of tomato sauce, a quick sauté of corn, tomatoes, garlic, and jalapeño peppers, and a sprinkle of Parmesan cheese. The whole thing gets baked in the oven until it is bubbly then you get summer on a plate. Besides its deliciousness and seasonal appeal, here are some things I like about this recipe. You can make the tomato sauce days before and the polenta a day or two before. You can assemble the whole thing early in the day and keep it in the refrigerator until ready to bake. You can bake it about two hours before you want to serve it and just let people eat it room temperature. This is healthy food that is super flavorful. Really the only fat you are getting is from a small amount of Parmesan cheese. It makes a LOT of food. In fact, I cut this recipe in half which is something I rarely do. I find it’s always better to have more food on hand than less – if for no other reason that wonderful people like to babysit at my house because there is usually something good in the refrigerator. But I made this early in the week and I knew there would not be a lot of leftover eating so I made less. We still could have fed four with the dish. First make the polenta. Make sure you have plenty of time to allow it to set up. Heat the butter in a large skillet and add the corn. Sauté over medium heat just until the corn is tender, about 5 minutes for very fresh corn. Season with a sprinkling of salt. While the corn is cooking, cut the tomatoes into large pieces. Marinate the tomatoes in the olive oil with a ¼ teaspoon of salt and a few grinds of pepper. 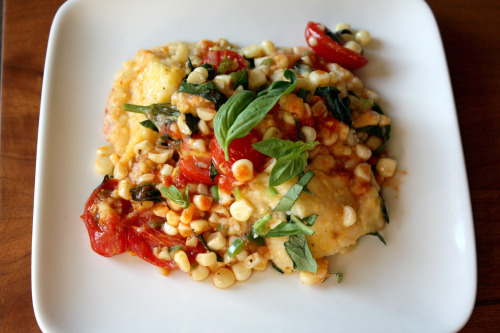 Cool the corn and toss with the tomatoes, half the basil, and the chiles. Add salt and pepper to taste. Preheat the oven to 375ºF. Pour the tomato sauce into the bottom of a 9×13-inch baking pan. Arrange the polenta triangles upright in tows across the width of the dish, overlapping the triangles slightly; use all of the polenta. Spoon the vegetables into the spaces between the polenta triangles, separating the rows as you go. Sprinkle with the cheese. Cover and bake for 25 minutes, then uncover and bake for 10 more minutes, until the gratin is bubbly. Sprinkle on the remaining basil and serve. To keep the whole dish even more healthy, I skipped the butter and cheese in the actual polenta but you can add them for even more flavor. Lightly oil a 9×13-inch baking dish and set aside. Bring the water to a boil in a large saucepan. Add the salt, then vigorously whisk in the cornmeal. Bring it back to a boil, stirring all the while, then reduce the heat as low as it will go. Cover the pan. Stir every 5 minutes or so until the polenta is smooth, about 20 minutes all together. Remove the pan from the heat and stir in the pepper, the butter, and the cheese. Pour the hot polenta into the baking dish and set aside to cool. Once it is cool, cover and refrigerate to make the polenta even more firm. Once cold, dump the whole thing out on a cutting board and cut it into 12 squares. Cut each square into two triangles. The upcoming heatwave is leaving this Portlander a bit confused too–I’m thrilled for all the heat the tomatoes will be soaking up. Not so much for the heat I’ll have to withstand. Guess I’ll be a good sport and settle back with a tall gin and tonic. Dana–I haven’t cooked polenta on the stove in years–there’s a baked version which is so easy, and though it takes longer, it is far less demanding (I first learned about it from a Paula Wolfert book). Here’s a link to my blogpost on baked polenta and the baked polenta recipe. If you want some of my warm weather, you are more than welcome to it. I’m sick of it. And in return I will take a nice slice of this casserole. K thanks! Every polenta dish I have ever made has been ho-hum, and I’m not entirely sure I’ve ever made the polenta itself totally right. I am sure that this dish is far from ho-hum, and that method for the polenta sounds fail proof — will give it a try. Hoping lots of sunshine comes your way! Come back east for summer. It’s been over 90F everyday, with no rain, and blaring sun. Corn and tomatoes are going crazy and this looks DELICIOUS! This looks scrumptious! 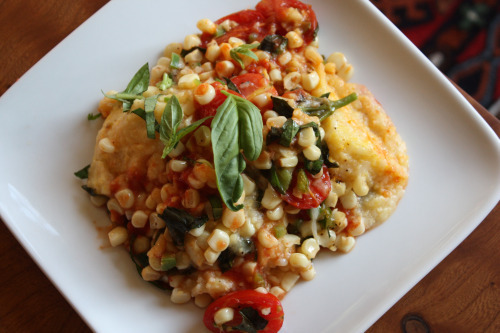 I love polenta, especially with all of those summer veggies. I love polenta — this looks wonderful! Summer on a plate is right! I have everything but the corn in my kitchen right now, and its already on my list for next week. Can’t wait to try this. Glad you are finally getting your summer (one way or another)! We are in the middle of our kitchen remodel and can’t cook or bake until it is done. I am missing out on summer’s bounty! It makes me sad. I would love to be able to make this for dinner tonight. Seriously, I can’t believe this summer! I really need to try out your methods for risotto and polenta. This looks delicious! great combination,polenta and veggies!i love it! Summer corn and tomatoes, SO GOOD. It may not feel incredibly summery in Seattle, but foods like this must remind you that it really is August (believe it or not). Love the easy do-ahead steps too. 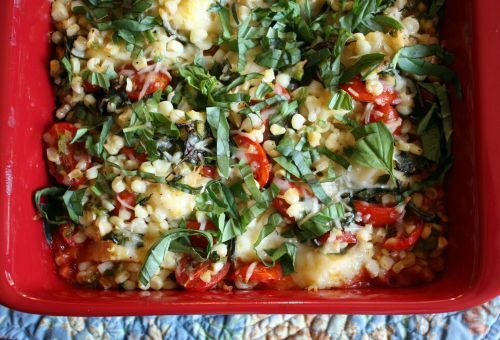 But, we do share them summery’ness of this dish and it looks perfect for the tomatoes (my favorite) and corn I have been getting at the farmers market! Yum perfect summer meal! I seem to forget about polenta. And really need to get that cookbook! I can’t wait to make this, although we are having the opposite weather problem in Dallas this summer… it’s 105 degrees today. Too hot, even for Texas! Judging by your comments – our summer must be a teensy bit better than yours just a few hours to the north of you. This dish looks yummy – very similar to one I make with new potatoes. I love the idea of polenta – thanks! I rarely cook polenta, but next time will use your method (I just cooked some brown rice per CI method, and was pretty happy with it). I love this! Without the corn tonight, so I substituted toasted pine nuts for the corn. Worked out great – added that bit of nuttiness and crunch. Fresh basil and toms from the garden is all you need! Thanks for a great recipe! Hi Dana, I just made this tonight for me, my mom, and brother, and it was delicious! As always, thanks for the great meals!